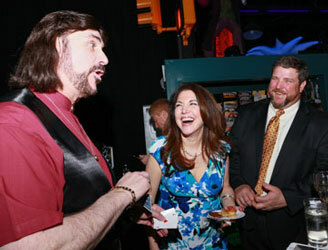 Marco performs strolling magic at a corporate carnival event! 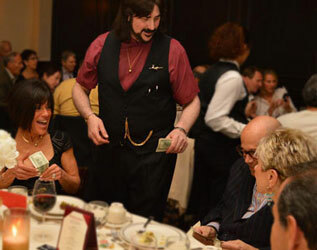 Strolling magical entertainment is a speciality of NJ Magician Magic of Marco and is a great ice breaker for any event with or without a cocktail hour!! What is Strolling and Close-Up Magic? 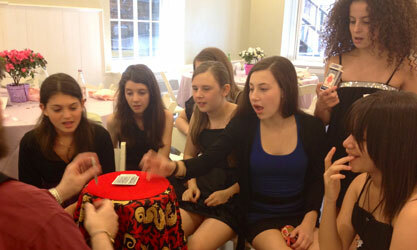 Close-up Magic is simply magic performed up close and on a personal level for small groups of people. Strolling Close-up Magic can be performed at any event. Walking around hospitality suites, cocktail hours, catered events, and large indoor & outdoor events entertaining your guests is a speciality of Marco. Marco's props are small and self contained, so he can stroll around while performing sleight of hand magical entertainment anywhere, anytime, and under any situation. Your guests will truly be amazed as objects appear and disappear, even from their own hands! It is a wonderful ice breaker or ideal way to get your party or event buzzing!. Are you looking for a Magician that does more than just CARD TRICKS? Most strolling magicians bring just a deck of cards to the events they perform at. Marco uses various magical props to perform his brand of sleight of hand magical entertainment!! Marco can move an object with his mind, vanish objects in his bare hands, outstanding coin effects, make things rise, and yes a killer card trick or 2, all with a comedic edge! Marco is a strolling magical entertainer who is able to kick your event off with fun and festive entertainment. Mostly he is used as an ice breaker to loosen up your guests and put them in a partying mood. Marco's style of magic appeals mostly to the sophisticated adult. Strolling Magic works best at these events! Your guests will truly be amazed! As objects appear and disappear, even from their own hands! It is a wonderful ice breaker or ideal way to get your party or event buzzing! Hire New Jersey magician Magic of Marco for magic shows in New Jersey, magic shows in New York, NYC, or Westchester, If you're requesting a strolling magician in NJ, strolling magicians in NYC, strolling magic in Westchester, or a strolling magician in New Jersey, you have come to the right website. NJ Comedy magician Marco performs corporate magic, adult magic shows as well as family & children's magic shows in NJ, NYC, CT, PA, and Nationwide.